Whether you’re interested in hooking up the camper or getting off the grid, Sleeping Bear Dunes camping offers a wide spectrum of options for campers of all ages and skill levels. Below is a list of the various National Park Service-operated campsites—including those on North and South Manitou Islands—as well as several Leelanau County campsites that offer easy accessibility to the Dunes. Note, campgrounds operated by the National Park Service require a park entrance pass. An annual pass costs $45 and a 7-day pass for a private vehicle costs $25. Find more rates here. Camping fees vary by site. Find current fees here. The Platte River Campground is situated approximately 2.5 miles south of Lake Michigan near the southern tip of the Sleeping Bear Dunes National Lakeshore; the campsite is accessible by M22. For groups of six or fewer people, the campground has pull-through sites with electrical hook-ups suitable for full-sized RV’s, as well as tent-only and walk-in sites. Several group sites are available to up to 25 campers per party; these sites lack electrical hook-ups and are tent only. Reservations can be made up to six months in advance for arrival dates of May 1 through October 15 by calling 1-877-444-6777 or make your reservation online. New: In 2019, all campsites at Platte River Campground must be reserved (no walk-ups). The change will address the overnight waiting lines that typically crowded the campground entrances. Reservations will be accepted right up to the day-of-camping (same-day reservations) so the opportunity to get last-minute campsites will still be available. Camping reservations will be required for arrival dates of May 1 through October 14. Between Memorial Day and Labor Day, campers are limited to 14 nights in a specific campground. The Platte River Campground is adjacent to the Platte River, a canoe and tube-friendly river that empties into Lake Michigan. The Platte Plains trails—with miles of easy-going trails featuring views of Lake Michigan—is accessible from the campground via a short walk. With M22 nearby, the rest of the Sleeping Bear Dunes Lakeshore is accessible by car. The Platte River Campground offers the most modern amenities of any campground at the Dunes. Regular campsites feature campfire rings, paved roads, picnic tables, nearby flush toilets and hot showers available for a slight fee. For campers seeking more rustic accommodations, consider the DH Day Campground. All 88 private sites lack electrical hook-ups—giving the grounds a truly unconnected vibe—and the proximity to Lake Michigan (across the street from the campground’s north border), the Dune Climb and Pierce Stocking Scenic Drive (both about 2 miles away) are hard to beat. Electrical generators may be used at certain sites (#1 to #31) from 9 a.m. to 6 p.m.
DH Day Campground sits 1.5 miles west of Glen Arbor on M109. This ground is relatively rustic compared to the Platte River Campground, offering only vaulted toilets and water spigots throughout the grounds. Fires must be restricted to the campfire rings at each site. New: In 2019, all campsites at DH Day Campground must be reserved. Reservations will be accepted right up to the day-of-camping (same-day reservations) so the opportunity to get last-minute campsites will still be available. Camping reservations will be required for arrival dates of May 1 through October 14. Between Memorial Day and Labor Day, campers are limited to 14 nights in a specific campground. South Manitou Island offers tent-only, backcountry camping at three separate grounds: Bay, Weather Station, and Popple grounds. A ferry to the island is provided by the family-owned Manitou Island Transit, which is located in the Fishtown district of Leland; the ferry takes approximately 90 minutes to complete a one-way journey. Reserving tickets for the ferry is recommended, as it can book up; Manitou Island Transit can be reached at 231.256.9061 or at the company’s website. For small groups of four or fewer, camping permits ($10 per site per night) and national park passes may be purchased at Manitou Island Transit’s dockside office. Larger groups (up to 20 people) may also camp at Weather or Popple grounds by reserving one of 6 total group sites: visit Recreation.gov to check the availability of group sites. The three campgrounds on South Manitou Island offer similar camping experiences, as the island is only about 8 square miles in area. Bay campground has 25 sites and is about a five-minute walk from the island’s dock; given the ground’s proximity to the dock and on-site potable water, it is typically the most crowded of the three sites. Weather Station is slightly farther from the dock—about 1.3 miles to the southwest; Weather Station has 20 individual sites and 3 group sites and offers on-site potable water. Popple grounds is located 3.7 miles north of the dock, and with only seven individual sites it is the most isolated and sparsely populated of the three grounds; there is no potable water available, so campers must bring filtration equipment. Camping on South Manitou Island requires a certain respect for the island’s ecosystem and other campers; all camping equipment must be carried in upon arrival and off upon departure. Fires are restricted to the communal fire rings at the three campgrounds—each site does not have its own ring. Toilet paper must be brought to the island. Despite its various logistical constraints, camping on South Manitou Island offers a sense of solitude trumped only by North Manitou Island. The island’s beauty is breathtaking, and campers can visit the island’s lighthouse, observe the wreck of the Fransisco Morazan, take a guided motor tour to learn about the island’s history or simply swim at the beaches adjacent to the three campsites and explore the woods. Read More About The Manitou Islands. North Manitou offers the most solitary camping experience in Northern Michigan. The island is operated as a protected wilderness area, meaning that visitors must exercise the utmost respect for the island’s pristine ecosystem—even used toilet paper must be carried off the island if possible. Camps can be set up almost anywhere on the island; however, all camps must be at least 300 feet from water, buildings and other camps. Given the island’s 22 square miles of wilderness, that’s not much of a concession. There are only eight designated campsites on the island, which are near the island’s dock and the Ranger Station in the Village. The island’s only water spigot and outhouse are also located near the Ranger Station. Wood fires are permitted only in the two fire rings at the Village’s campsite. With such limited resources available on the island, campers must rely on their own skill and intuition to successfully camp; camping on North Manitou Island is therefore not recommended for novice campers. Transportation to the island is provided by Manitou Island Transit; call them at 231.256.9061 or visit the company’s website for more information and a schedule. Permits and passes must be purchased at their Leland dock before arriving on North Manitou Island. As a truly isolated island, camping on North Manitou Island offers visitors an authentic escape; exploring the island’s abandoned cemetery, orchards and homes transport campers to a world that predates modernity. White Pine Backcountry Camp is located a half-mile east of Lake Michigan near the Platte River Campground, where camping permits can be bought. Access the site via the Platte Plains Trail: it’s about a 2-mile walk from either the Platte River Campground or the Platte Plains Trail’s trailhead. This camp has only six sites, one communal fire ring and no potable water—water can be retrieved from Lake Michigan and must be treated. Valley View Backcountry Camp is located off of M22 near the Homestead Resort; purchase permits at DH Day Campground and drive south of M22 to Westman Rd, take a quick left onto Hyland, then a quick right to a trailhead that leads to the camp. From the trailhead, the grounds are about 1.5 miles to the north. 5 sites, no water (haul your own), 2 communal rings and a pit toilet. Indigo Bluffs Motorcoach Resort near Empire offers both upscale and more modest accommodations for those traveling by RV; with an on-site pool and playground and proximity to the Lakeshore (less than 10 minutes away from every Dunes attraction), you may want to just buy a lot at Indigo Bluffs. Call 231.326.5050 or visit IndigoBluffs.com. 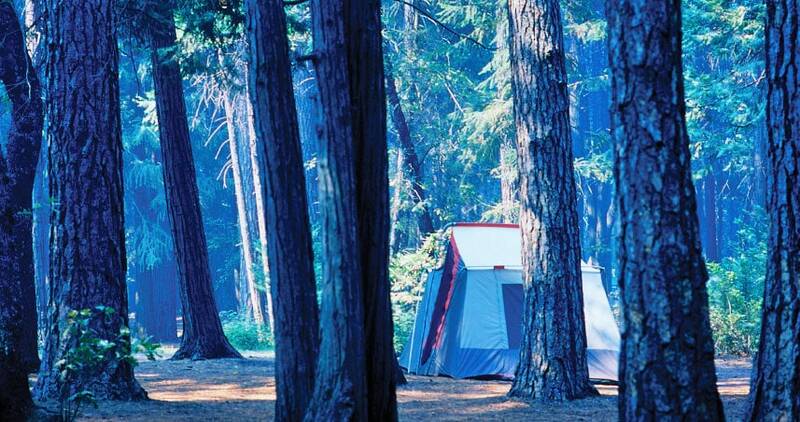 Empire Township Campground is inexpensive, spacious, and only 5 miles from Empire. The campground has 60 rustic sites, among which 9 have electrical hook-ups and 2 are group sites. Hot showers and flush toilets. Visit the campground’s website or call 231.326.5285 for information. Betsie River Campsite near Frankfort features a bike trail that connects the grounds to downtown Frankfort, making the 3-mile ride to Frankfort’s beautiful beach and downtown a breeze. Hot showers and flush toilets, plenty of pull through sites with water and electricity. Visit their website or call 231.352.9535 for more info.